SALT LAKE CITY, U.T. – The No. 9 Syracuse men’s basketball team could not muster enough second-half offense and fell to No. 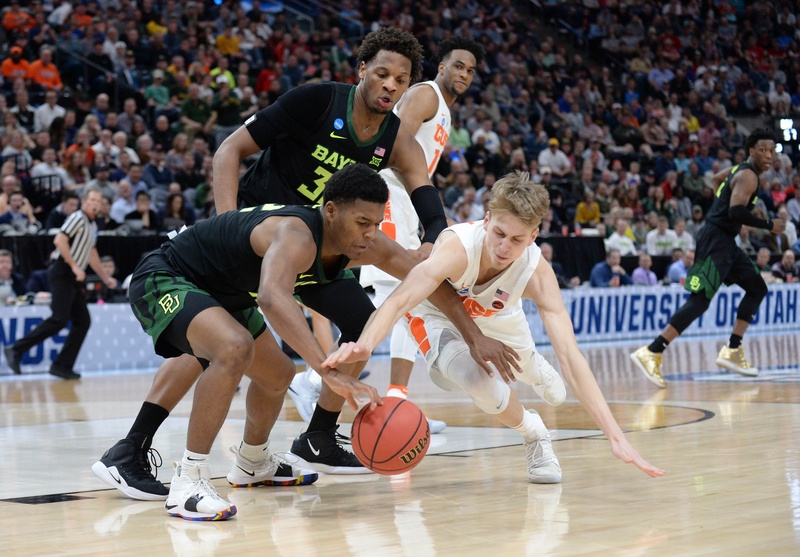 8 Baylor, 78-69, in the first round of the NCAA Tournament at Vivint Smart Home Arena, Thursday night. Trailing 38-37 at halftime, the Orange scored 32 points on 9-of-29 shooting from the field (31 percent) in the second half, including 3-of-12 from beyond the arc. Elijah Hughes scored 18 of his game-high 25 points through the first 20 minutes of game play. The junior forward shot 7-of-15 from the field, knocked down six three-pointers, collected three rebounds, handed out three assists, blocked a pair of shots and swiped a steal. Junior guard Tyus Battle netted 16 points along with three assists, two rebounds and a steal. Sophomore forward Oshae Brissett chipped in 14 points, pulled down a team-high eight rebounds, blocked two shots, collected an assist and a steal. Baylor used a three-point attack to beat Syracuse’s zone defense with 34 of its 52 field goal attempts coming from outside the arc. The Bears knocked down 16 long-range shots – the most the Orange have allowed in a NCAA Tournament game. Makai Mason, a transfer who led Yale to a victory over Baylor in the 2016 NCAA Tournament, netted 22 points and made four shots from beyond the arc, both team-highs. The senior guard grabbed four rebounds, dished out four assists and swiped three steals. Mario Kegler had 13 points on 4-of-7 shooting, including 3-of-3 from outside the arc. The sophomore guard collected four rebounds, handed out an assist and blocked a shot. Sophomore guard Mark Vital pulled down a team-high six rebounds as the Bears out-rebounded the Orange, 31-28. Baylor advances to the second round to play top-seeded Gonzaga on Saturday at 7:10 PM. The Bulldogs took down No. 16 Farleigh Dickinson Thursday evening, 87-49.